Why spend a fortune on Starbucks when you can make Pumpkin Spice Lattes at home? Scroll down for the recipe! Did you feel it today? The cold wind has blown in along with some crumpled brown leaves and we are on our way to Christmas! Autumn has well and truly arrived. Another sure fire way to tell the changing of the seasons is a little less romantic…just look in shop windows to see the autumnal themed displays and Christmas gifts appearing near tills! I’m not a fan of coffee unfortunately which means I often miss out on this changing of the seasons event so this year I decided I would make my own. Why pay nearly £3 for a lukewarm drink when you can make your own at home! You can even serve it in your favourite mug – yay! Oh and in case you missed the scandal a couple of years ago…the Starbucks Pumpkin Spice Latte doesn’t even contain pumpkin!!! I was actually surprised at just how easy it was to make the pumpkin spice base. With a can of pumpkin purée lurking in my cupboard and cinnamon and nutmeg jostling with other long-forgotten spices that haven’t been touched since last Christmas, I soon discovered I actually had all of the ingredients I would need right here. No trip to the supermarket for me. With this easy to follow recipe you will be able to ditch the trek to the coffee house out in the cold this autumn and instead invite your friends round to yours! Why not ask them bring the cookies and cake? 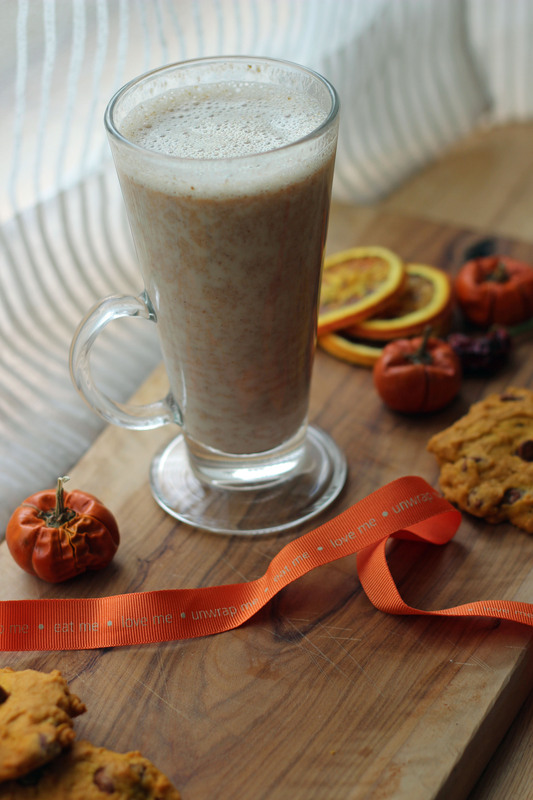 Here you'll find out how to make a pumpkin spice latte base, made with REAL pumpkin. I'll also show you how to turn that base into a hot drink. Mix together the pumpkin puree, sugar and spices in a small bowl until a smooth paste has formed. Store in a steralised jar in the fridge until you need to use it. Fill your favourite mug with a glass of milk. Pour the glass of milk into a milk pan and heat slowly on a low heat. Add the tablespoon of pumpkin spice latte base along with the coffee and whisk until the mixture is smooth and creamy. Whisk fast enough and you'll get that real coffee house frofth! Once the milk is at your desired temperature, decant back into your favourite mug. Top with squirty cream and sprinkles if you wish. So, as you snuggle up on your sofa with home-made pumpkin spice latte in hand, look out at the bleak autumn sky and smile. Not only did you avoid having to wait in line for you pumpkin spice latte…but remember this, it’s only 79 days until Christmas! Thanks Belle! Believe it or not, it tastes better than it looks. Thanks 🙂 that means a lot! Oops, meant to say more than just yummy! This looks great, and I bet it tastes a whole lot better than the gross starbucks version! Thanks Kerry! I still can’t believe that the Starbucks version doesn’t have ANY pumpkin in. I don’t understand how its possible to make one without!? homemade pumpkin spice latte is sooo much better than store-bought, especially when made with fresh pumpkin. your recipe sounds delightful! I couldn’t agree more jacquee! Fresh pumpkin is what makes this better than most 😀 glad you like it!